DC is banking on readers being curious as to just how Batman, Superman, and Watchmen characters like Dr. Manhattan and Rorschach will ultimately collide over the course of Doomsday Clock. But the most fascinating part of the series so far hasn’t actually been any of its heroes—it’s a mime. A criminal mime. In Doomsday Clock’s first issue, we were introduced to Erika Manson and Marco Maez, a married pair of two-bit criminals who decided to spice things up by adopting the Marionette and Mime personae. Together, the two would commit crimes in character, with Marionette doing most of the talking and slicing (with a thin, razor-sharp “marionette” string) and Mime doing most of the punching and intimidating. At the start of the series, Marionette and the Mime had already been apprehended by the first Rorschach and thrown in jail, but the couple play a key role in this week’s issue that begins by detailing Rorschach and Ozymandias’ plan to save the world. Taken at face value, Marionette and the Mime don’t bring all that much to the table given that they’re just regular humans in costumes and make-up. But Ozymandias explains to Rorschach that Marionette is actually a beacon of sorts, meant to help them track down Dr. Manhattan. In a flashback, we see how Manhattan came close to killing the criminal duo after catching them in the midst of a murder spree, only to let them live after realizing that Marionette was pregnant at the time. 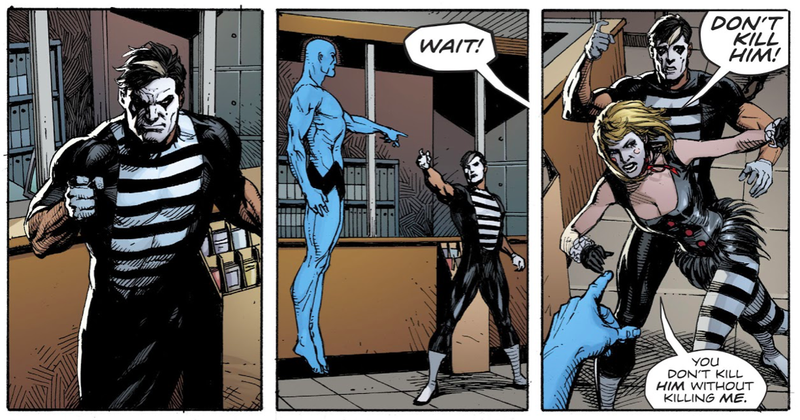 Because Doomsday Clock is the slowest of slow burns, the second issue doesn’t actually feature all that much in the way of shocking plot twists, but it does raise at least one major question about the Mime that I need answered. At this point in Doomsday Clock, the the United States and Russia have just fired nuclear missiles at one another and the world is effectively about to end. Desperate to find a solution, Rorschach, Ozymandias, Marionette, and the Mime all clamber into Nite Owl II’s Owlship with a loosely-explained plan to somehow follow the trail of electrons emanating from Manhattan’s body in hopes of finding him. Just as the first bomb hits New York City, the quartet are hurled through the multiverse and they unceremoniously crash land in Gotham City. Unsure of their strange settings, Rorschach and Ozymandias reason that they need to track down the two smartest people in this new world—Bruce Wayne and Lex Luthor. The two split up with plans to regroup after they’ve found their respective targets, but they also double back to make sure that Marionette and the Mime are handcuffed to the Owlship. Sensible, right? Now. This is where things get weird. Just to make sure that we’re all on the same page here: The man procures an imaginary lockpick and then proceeds to use it (off-panel) to free himself. Here’s why this is weird and confusing and fabulous all at once—Doomsday Clock refuses to establish whether the Mime is really just a mime or whether the things “he carries” are actually real. Later on, the Mime even threatens to shoot Rorschach and the masked vigilante responds by asking him not to point imaginary guns to the back of his head. Rorschach seems to believe that the guns aren’t real, and there’s a very good chance that the Mime’s just an insane person, but if so, that definitely begs the question as to how the Mime was able to become a “super”villain in the first place. How do you hold up a bank with just your fingers? Why didn’t anyone ever just, you know, fight back? Sure, the Mime is muscular as all get-out, but if those weapons aren’t real, he’s really just another man. But if they are real... does that mean the Mime can bring anything he imagines to life? Or does he have a set amount of items? Are they invisible but tangible? Does he call them forth from somewhere, or does he have them hidden on his body? How and/or why are they invisible? Basically, what’s the deal with this guy?! Doomsday Clock is beginning to hint that Dr. Manhattan may be hiding out in DC’s Universe masquerading as a character we already know and that may very well be true, but the only mystery I’m really interested in solving is all about that killer mime and his finger guns.